The group behind several viral billboards also called for MPs to take notice of the change in public opinion since the 2016 referendum and highlighted there is now “2 million” more potential voters. The Remainers also took aim at the former Brexit secretary Dominic Raab and beamed a particularly embarrassing quote from him about the importance of Dover for trade. 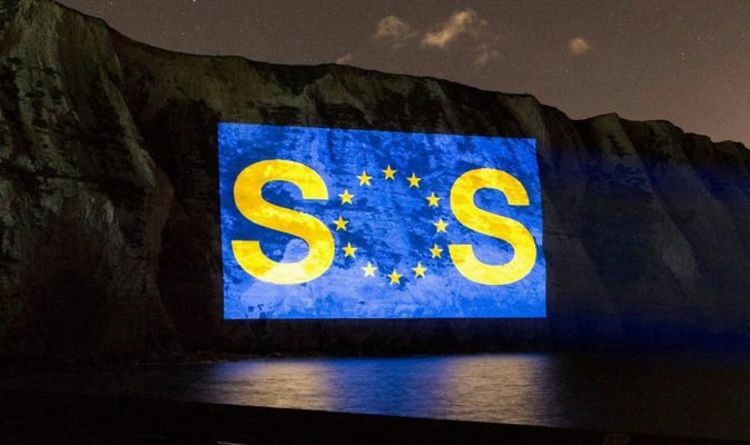 The demonstrators also posted the SOS image on social media, and accompanied this by begging for help from the French President and German Chancellor whilst taking aim at “hard right” Brexiteers. Led By Donkeys wrote on Twitter: “Dear Emmanuel Macron and Angela Merkel, opportunists from the hard right want Britain to crash out of Europe, even though a majority now wants to stay. Earlier Ms Merkel said she was still hopeful that a no-deal Brexit could be avoided as "where there's a will there's a way". The anti-Brexit post has since gone vital and drew some considerable attention from Europhile Guy Verhofstadt. The Brexit Coordinator responded on Twiiter by saying: "Quite something to see the White Cliffs of Dover turn blue. “But the European project is much more than a lifebuoy. It's our rock on which we have to build our future, especially in turbulent times." Meanwhile the prospect of a no deal Brexit decreased last night after legislation tabled by Labour's Yvette Cooper passed through the House of Commons with a majority of just one vote. However the bill needs to be approved by the House of Lords who are yet make a decision. But any agreement to extend Article 50 needs to be approved by all 27 EU member states otherwise the default position remains the UK will leave the European Union without a deal on April 12.